We feel your pain, it’s annoying. That said, Gmail has a way around this. That solution is called Gmail offline mode—and it’s a Godsend. Using it, you can read, respond to, and even search your Gmail messages while you’re away from civilization. 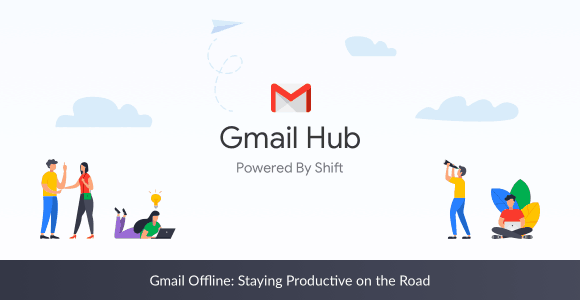 To use Gmail’s offline mode, you have to log in and out of each of your Gmail accounts to enable it; that is unless you have Shift. Note: You can use Gmail offline in Shift with multiple Gmail accounts – party! Offline means precisely what it says. You’re not connected to any form of internet connection. As a result, because you’re offline, there are a few things you can’t do. That said, there are also a couple of things you can. – View synced emails from your inbox without internet access. – Store emails up to 7, 30, or 90 days old. – Compose a new email: When you hit “send” while in offline mode, the composed message will be saved to your outbox and send automatically when you are back online. Who knew offline emailing could ever be a thing?